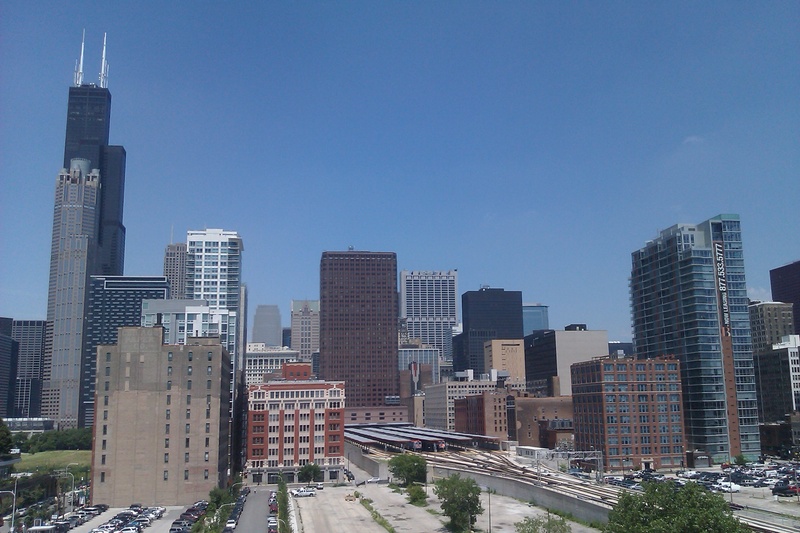 Chicago’s South Loop experienced a real estate boom in the early 2000s. Most of the area south of Congress Parkway between Lake Michigan and the Chicago River, excepting Chinatown, is referred to as the South Loop. Perceptions of the southern boundary of the neighborhood have changed as development spread south and the name is now used as far south as 26th Street. Dearborn Station at the south end of Printers Row in the South Loop is the oldest train station still standing in Chicago. It was converted to retail and office space. The South Loop includes former rail yards that have been redeveloped as new-town-in-town such as Dearborn Park and Central Station. Former warehouses and factory lofts have been converted to residential buildings, while new townhouses and high rises have been developed on vacant or underused land. A major landowner in the South Loop is Columbia College, a private school that owns 17 buildings. There is a major “L” station at Roosevelt where the Red line as a subway station meets the Orange and Green lines as an elevated train station. Harrison is the other Red Line “L” stop in the South Loop. CTA buses run on Halsted Street, Clark Street, State Street, Michigan Avenue, Roosevelt Street, 18th Street and Cermak Street. There is plenty of paid street parking while some residential sections require permit parking. Taxis are becoming more available on the major streets during rush hour times. South Loop is zoned for the following Chicago Public Schools: South Loop School and Phillips Academy High School. Jones College Prep High School, which is a selective enrollment prep school, draws students from the entire city. Columbia College, DePaul University Downtown, East-West University and Roosevelt University all call the South Loop home. With the boom in new real estate construction in the South Loop over the past ten years, a wide variety of restaurants and shopping opportunities became available to residents. You can find everything from brunch to coffee shops, Chicago style pizza to sushi and pretty much everything else in between. There is an over the top entertainment center at Roosevelt Collection called ShowPlace ICON. Shopping opportunities extend all along Roosevelt Avenue and up and down State Street, Michigan Avenue and Halsted Street in the South Loop. Grant Park is famous for its huge outdoor summer festivals, concerts and events and even for President Obama’s victory speech. It is often referred to as “Chicago’s front yard”. 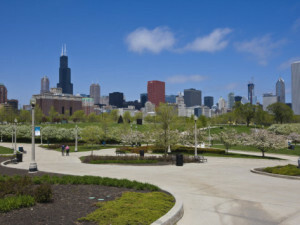 Reconstruction of the north bound lanes of Lake Shore Drive in 1996 created a spectacular park in the South Loop called the Museum Campus which is home to Field Museum, Shedd Aquarium and Alder Planetarium and features some the most spectacular views of Chicago. Soldier Field is also part of the Museum Campus and gives sports fans easy access via the Roosevelt “L” stop. The South Loop was historically home to vice districts including the brothels, bars, burlesque theaters and arcades. Inexpensive residential hotels on Van Buren and State Street made it one of the city’s Skid Rows until the 1970s. Then in early 2000s, Chicagoans began to look for real estate that was close to their work in the Loop that was not as expensive as other neighborhoods and the South Loop became a hot spot for new residential development.